Need a frame in a hurry? In addition to custom framing, Framers Market maintains a selection of PRE-MADE FRAMES in standard sizes from 4” x 6” to 24” x 36”, and some unusual sizes as small as 4” x 4”. We often build small frames from short pieces of moulding left over from custom projects, and from discontinued stock. The selection is constantly changing. READYMADE PICTURE FRAMES are an economical choice. Many come with glass, but all can be purchased as open frames. Personalize a standard frame by adding a special mat or upgrade to Conservation Glass for a semi–custom project. Do you need multiple frames of the same size and style? Ask about a discount when you order in quantity. Please allow 2–4 weeks for delivery. The Method Lights ML100 is the best picture light in the industry. The ML100 is a ceiling mounted battery operated picture light with remote control. It was specifically designed for lighting art with features that allow complete control of dimming, color temperature and timer settings. The ML100 can bring your art to life. 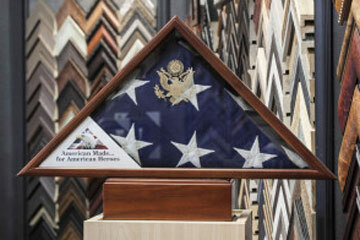 Framers Market is proud to associate with SPARTACRAFT, flag case provider to the military for over 25 years. Specialists in manufacturing Flag Cases for memorial and display flags, and medal display cases, urns and accessories, their slogan is MADE IN AMERICA … FOR AMERICAN HEROES. You can check out their full catalog at SpartCraft.com, then come to Framers Market to place your order. The Prisma Line of frames offer contemporary designs and beautiful colors to make your art or photos stand out. Part art and part science, Prisma Frames combine engineering ingenuity with a passion for great picture frame design. These designs that spill outside the limits of traditional picture framing. Filling a unique niche for extraordinary framing, Prisma Frames are highly sought after from coast to coast. Prisma Frames find a home in any residential or commercial design-driven environment. Seamless frames as original as your designs. Design your own Prisma. The choice is yours. 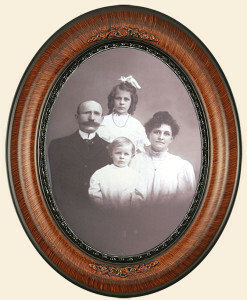 Need to replace the convex glass on that antique oval portrait of your great-grandparents? Or do you need a new frame that blends with the vintage look of your antique furniture? We can help. Come in to the Framers Market to see the wide selection of oval, round, and other special frame shapes and finishes available. Banish that bare mirror! We can add custom frames to your existing mirrors. Or we can start from scratch to build a frame that fits your space, and custom cut a mirror to fit. Oval and other unique shapes also available by special order. Create any word using unique ALPHABET PHOTOS taken in Prescott by Prescott photographer Bonnie Dann. The letters can be individually printed photos that are matted and framed, or the letters can be arranged and printed as a poster. Spell out your family name, your favorite city, or an inspirational message; commemorate a wedding, anniversary, retirement, birth, a new home; add an inscription with names and dates – there’s no limit to the possibilities. These crystal clear acrylic blocks snap together with tiny rare earth magnets for a modern contemporary look. Your art or photos “float” in the center, sandwiched between two clear panels, perfect for anything that is odd-sized, or for a collage of small photos. The desktop versions range from 4″ x 6″ to 8″ x 10″ and are thick enough to stand on edge. Double your display space by placing photos back to back, or use for something double-sided like a letter, when you want to be able to see both front and back. Two sizes – 8×10 and 11×14 – are designed to hang on the wall. These versatile frames make it easy to quickly change photos – simply slide the two halves apart, place a new photo, and replace the top panel. ​The New Guestbook: Make your special event a day to remember with a unique guest book alternative — Engravable Mats. Have your guests sign the engravable photo mat with the included easy-to-use Signature Engraving Scribe. Signature Mats and Frames make a memorable keepsake for any wedding, anniversary, graduation, or other important milestone. Mats are available in a range of sizes as small as 8”x8” up to 20”x24” to accommodate any size gathering. These artisan-created matboards transform artwork to extraordinary. Richly textured surfaces, shimmering metals and organic textures take your artwork to the next level of “custom.” The Couture Matboard collection features 100% cotton core and backing, so rest assured that your artwork will look stunning AND be protected. Choose from finishes and textures of leather, pebbles, woven jute, spun platinum and tungsten, aged copper, and genuine gold and silver leaf. Here are some inspirational framed examples.